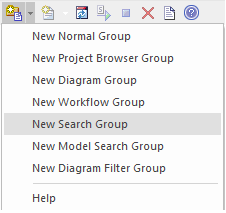 Scripts are managed and contained in groups. Each group has an attribute called 'Type'. This attribute is used to help Enterprise Architect decide how and where the script can be used and from which features it should be made available. The properties of a script group can be viewed from its shortcut menu. Built in scripts are file based and are installed with Enterprise Architect. They appear under the Local Scripts group. You cannot edit or delete Local scripts, but you can copy the contents easily enough. User defined scripts are model based and as such, can be shared by a community. They are listed in the group to which they belong..
Other than the Local Scripts, which are file based and installed with Enterprise Architect, all other scripts are stored as model assets and can be shared with its users. Script debuggers can help you with script development and script editors can provide you with information on the automation interfaces available to you. Analyze the execution; for example, by recording a Sequence diagram of the script execution, and halting execution to view local variables.